Eddie Stuart in his beloved gold and black. It wasn’t just the renowed 1950s Wolverhampton Wanderers half-back line that opposition forwards had to get past to catch a glimpse of Bert Williams or Malcolm Finlayson. Usually, among the powerhouses still blocking the way to goal was Eddie Stuart. Engaging, jovial, welcoming…..all are words that could justifiably be used to used to describe the South African-born defender in his off-field days and hours. None, I’m sure, would be appropriate in capturing the on-field persona of a man who helped Wolves to three League Championship triumphs and, as skipper, over several of the early hurdles when they won the FA Cup in 1959-60. Even in his later years, Eddie, who died this week aged 83, cut a formidable figure; tall and proud, with the shoulders to match and good looks to boot. 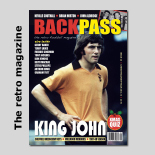 As a right-back – the position in which he was most seen during a Molineux career made up of 322 League and cup appearances – he must have been a daunting sight for the more timid members of the left-wing fraternity. He joked about how the drop from pitch level to the front rows of the old Molineux Street Stand was just too tempting when one of those pesky dribblers was at work and the shoulder charge was a legitimate weapon. It would have been dereliction of duty had he not occasionally let his would-be tormentor know he was around; all perfectly fairly, of course! As befitting a lad over from the Southern Hemisphere at a time when football was a much more insular game, though, he took a while to adjust and cement his place. 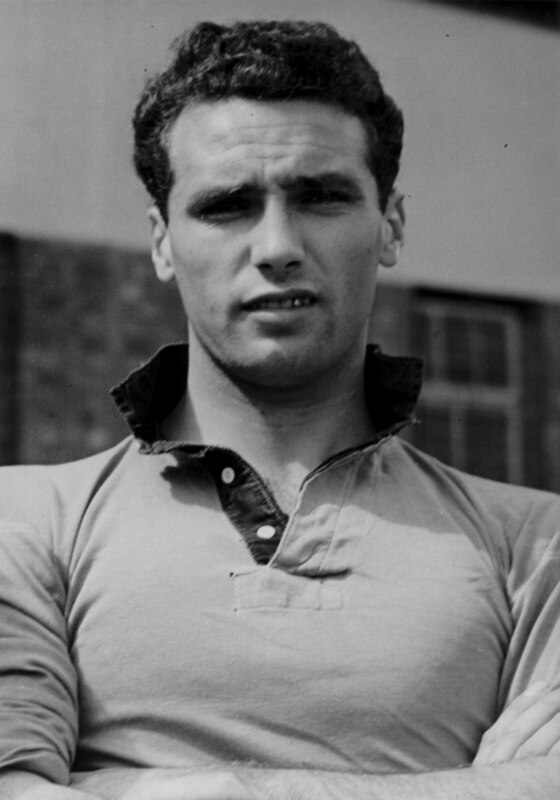 Against his parents’ wishes, he gave up a job in Barclays Bank in Johannesburg when Wolves acted on the advice of former Aston Villa and Bolton winger Billy Butler and signed him, still in his teens, from the city-based Rangers club in January, 1951. Stuart had £50 in his pocket when he landed and a box of chocolates in his luggage courtesy of a stop-over in Malta. Such luxuries were still rationed after the war and he didn’t get to taste many of them once his landlady in West Park realised it was a treat she had done without for too long. It was as a centre-forward that the tanned youngster made his first-team debut 15 months later in April, 1952. What odds would you have got on the goal he scored in that day’s 4-1 home League defeat against Albion being the only one he would deliver in his senior competitive career at the club? Wolves had toured the republic in the summer of 1951 but Eddie’s return there in the following close season almost had tragic consequences. He picked up a tropical malaria-type germ in Egypt on his trip back to England and was rushed to the Wolverhampton Queen Victoria Nursing Institution while a specialist was hurried from London to treat him. His life was saved but no-one was sure his football career could be. Even several months later, he was too weak to play. A proud night when the South Africans came to Molineux. His comeback could hardly have been more special. On the night South Africa provided the opposition in the autumn of 1953 for the first game under Molineux’s famous floodlights, Bill Shorthouse’s kindness in offering to stand down allowed Eddie to slot in as centre-half between Bill Slater and Billy Wright. 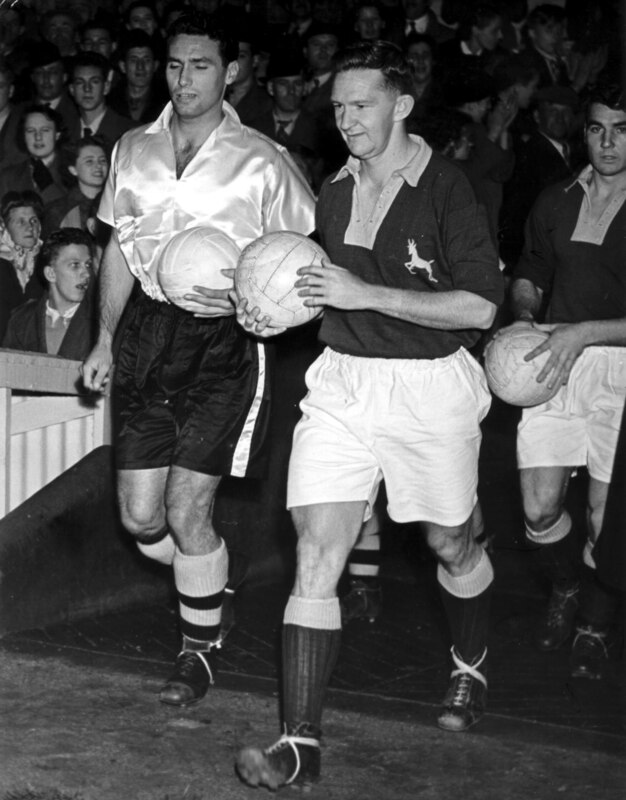 What’s more, Stan Cullis, not often regarded as a man for sentiment, bestowed upon the new boy the honour of leading the side out alongside his Springbok counterpart Ross Dow. “I was incredibly proud just to play against the national team from my home country but to captain Wolves for the first time made it even better,” he added. “The evening will stay with me forever. Playing under lights in those days was an incredible sensation. Everything looked different – the pitch, the stands, the crowd. It was a very colourful scene.” It was an intoxicating cocktail that he grew to know well. His return to League action wasn’t bad either. The 6-1 home win over Sheffield United cranked the title drive up a couple of notches and although his tally of 12 First Division One appearances that season (the last 12) wasn’t enough to win him a League Championship medal, he made a successful belated application for one around a decade ago. There was no doubting his automatic right to such a keepsake in 1957-58. By now well established after playing around three-quarters of the games in the meantime, he made 40 League appearances out of 42 for the champions and 38 when the crown was won again 12 months later, a nasty eye injury suffered in training threatening to rule him out of the victorious run-in. Stuart had stood in as Wright’s replacement as skipper on frequent occasions and was the chosen man when the icon on whom he doted hung his boots up in the pre-season of 1959. Having lived in digs close to Billy, he laughed about how he jumped aboard the same bus to training and matches, knowing that an England captain would never have to pay the fare! The first season without that famous shock of blond hair on view was very nearly the best of the lot. Wolves made it to Wembley and were within a fraction of becoming the first team in the 20th century to win the League and Cup double. For Eddie, though, it ended in bitter disappointment – intense enough for his voice to crack up with emotion when he reflected in an interview for the Official History of Wolves dvd almost half a century later. He had been a regular, as usual, during the first half of 1959-60, some of his outings coming in the no 5 shirt as George Showell struggled to come to terms with now being first-choice centre-half. And Stuart had missed only seven matches in two and a half seasons up to January 1. But events in South Africa, culminating in the Sharpeville Massacre and the deaths of 60 protestors in a black township, led to he and Cynthia receiving hate mail at the general store they ran in Newhampton Road. Eddie was even booed by a small minority of Wolves fans and was taken out of the starting line-up because Cullis considered his form to have suffered. He was used only fleetingly from then on and, like Bobby Mason, cut a dejected figure as he looked on at the 1960 FA Cup final victory over Blackburn. He was to make another 76 appearances over the next two seasons in a fading team and then skippered Stoke to promotion from the Second Division in his first year there before moving on to Tranmere and Stockport, the latter also going up (from the Fourth Division) with his help. 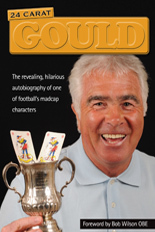 Thereafter, he had a non-League career with Worcester, including managerial experience, and ran a successful hairdressing business, with salons in Wolverhampton, Codsall and the Potteries. He loved getting his scrapbooks and photos out for visitors and I was sorry in 2005 when he and Cynthia gave up the delightful raised view they had over gorgeous gardens and moved to Wrexham, ironically half a mile or so from where Showell lived. I never saw him there, having found him to be out when knocking the door en route to watch Wayne Hennessey play in an international against New Zealand at the Racecourse. 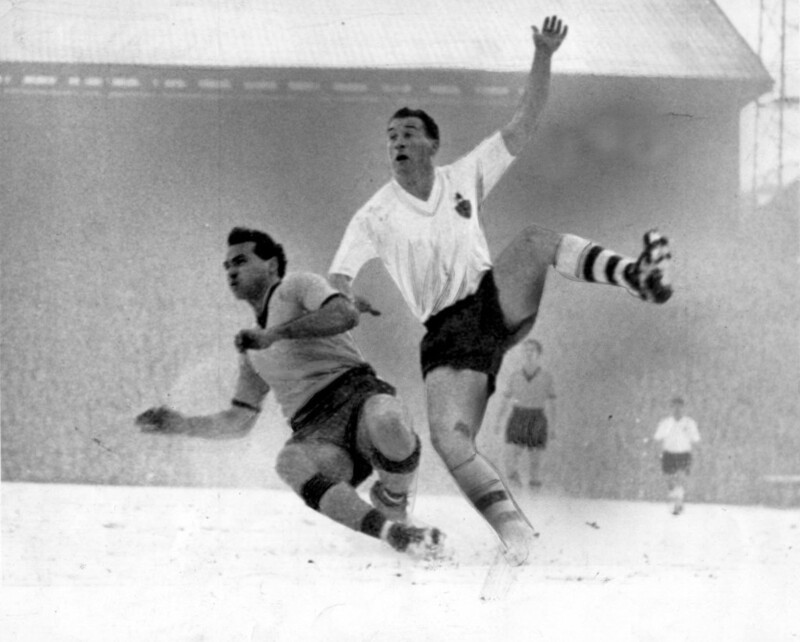 A skirmish in the Molineux snow with Bolton’s Nat Lofthouse. Eddie, not shy of telling the tale of how he had had his bottom pinched when he visited ladies at a local factory at the height of his Wolves career, named the 1957 club to South Africa as another of his career highlights. He underwent triple heart by-pass surgery six years ago and, when he returned to Molineux for the opening of the magnificent museum a couple of seasons ago, he was making light of the memory problems that seem to have afflicted so many players from these parts. He had suffered a lengthy period of illness when he died in Wrexham on Tuesday. Posted on: Friday, November 7th, 2014.